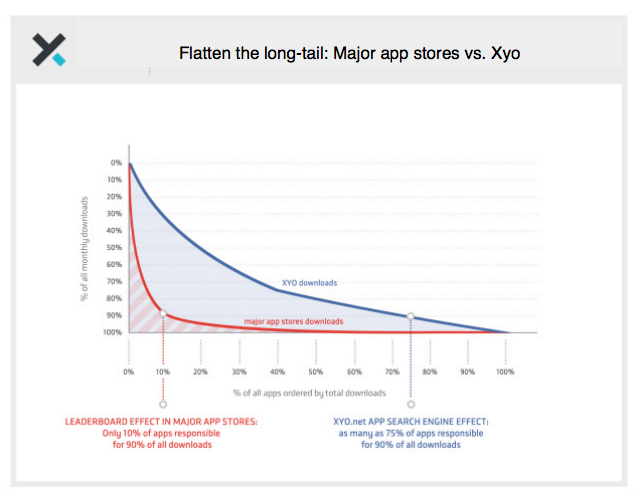 Talk to most developers and they will invariably say that the status quo of app discovery through rankings can’t really last. People have, of course, been saying this for a couple years. While Apple did make a few strides in acquiring app search startup Chomp, rankings still have an overwhelming influence over how consumers find and discover new apps. This leads to a winner-take-all effect where the long tail of apps have little hope of acquiring a meaningful number of downloads except through aggressive app store SEO or through paid marketing. 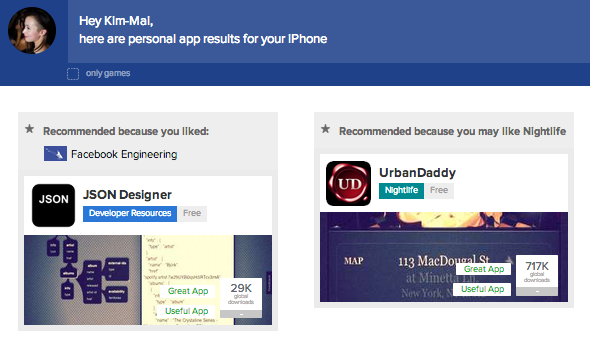 So another app search company, Xyologic, has quietly built its own engine plus personalized recommendations platform. They found that while people would come to Xyologic to look for apps, they often didn’t know exactly what they were looking for. Instead of installing apps directly from search results, they’d browse through “Similar” apps and apps that “People also like”. “The problem we all have in the industry is that people don’t know what to type. Most of the queries show little intent of what people want to use,” says Xyologic co-founder Matthaus Krzykowski. In response, the Berlin-based company built an recommendations system based off people’s Facebook likes, their friends’ preferences and hundreds of topics their engine has categorized. “Personally, I think the pre-selected knowledge of your friend’s interests in search results is the way to go,” he explains. When you log into the new Xyologic search engine, you’ll use Facebook Connect to pull your “likes” and interests into the recommendations engine. It will then come up with suggestions. For example, I was recommended magazine app Zinio because I’ve liked The New York Times and The New Yorker. I was also recommended categories of apps like cooking apps because I like certain cookbooks. The company can also integrate many other kinds of preference data easily. “The point about this Facebook integration is not Facebook. We can use YouTube or any other data that tells us something about the personal preferences of a person,” Krzykowski said. The company’s business model could come from the licensing deals it has with companies like Nokia, which uses Xyo’s app search engine to help Lumia owners find Windows Phone apps they might like based on the Android and iOS apps they know and like. Xyologic picked up funding last fall from Rick Thompson’s Signia Venture Partners, GameForge’s Klaas Kersting and Soundcloud founder Eric Wahlforss.